A few weeks ago, I went to a student council leadership conference with my 6th grade student council. Student council is the best extracurricular job in the school. These kids are some of the best students I had last year, and it's fun to work with them on projects that improve our school. One of the presentations was about thinking with your head vs thinking with your heart. The presentation itself was loud and crazy and full of pterodactyl noises (aka the kids loved it), but I think about the message almost daily, weeks later. 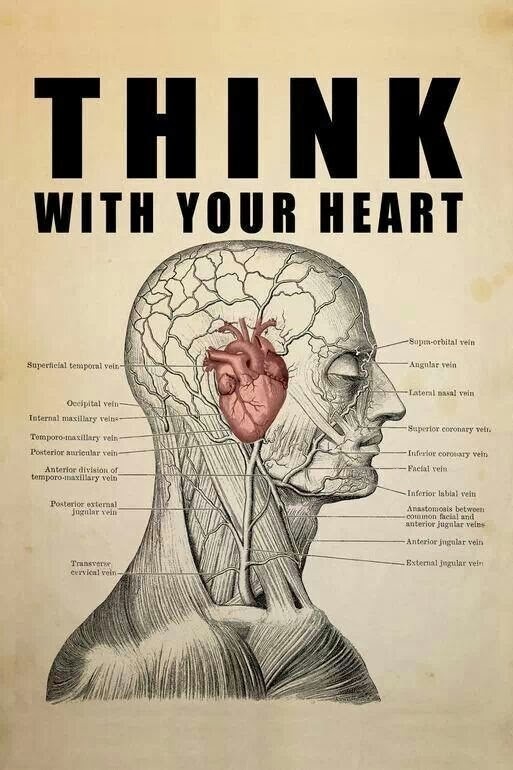 Think with your heart, not your head. It can be applied to things as simple as approaching someone in the hallway whom you haven't seen in a while. If you think with your head, you could be thinking "this is awkward. I haven't talked to them in forever. I don't know what to say. I think I'll just keep walking and pretend like I'm on my cell phone." But, if you think with your heart, you walk up to that person, smile, and say hi, because everyone needs a friend, and this is a great opportunity. I go through the head vs. heart battle daily in my job. My head says "it's late on a weeknight, I've been at work for 10 hours, and I'm not going to waste time writing nice notes to a few students right now. My self-preservation is more important." My heart says "Of course I'll take a few extra minutes to help this child understand how amazing they are. I want to foster that trust relationship between students and teacher." When it comes to my future, I am a huge head over-thinker. The thought of starting a family, moving to another state, grad school, etc. practically sets me into a panic. Stability! Income! Career choices! Student loans! my head screams at me. But when I think with my heart, I remember what's most important. Family! Happiness! My husband! Faith! My heart reassures me that if I focus on what's most important, everything will work out. One of the things I like best about little kids is that thinking with their heart comes to naturally to them. It's easy to express what's in their heart, such as "that makes me sad," "I want to play outside!" and "I love you." Adults aren't like that. Adults oftentimes have to think in their head by necessity (those bills won't pay themselves, after all). 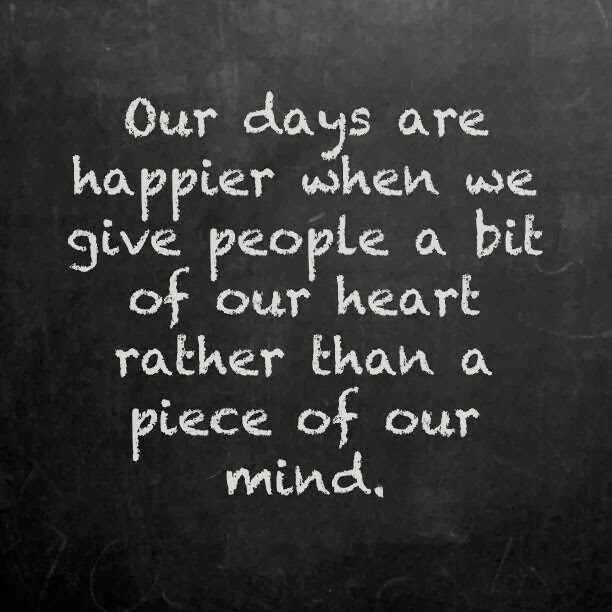 But, I think we get so used to thinking in our head that we often forget how to think with our heart. Thinking with your heart means finding the truth in all situations. The truth is, it's more important to be a friend than give into awkwardness and isolation by passing someone silently in the hall. The truth is, it's more important to stand up for the person who's being bullied, even if that makes you lose a friend or two, because you know it's right. The truth is, thinking with your heart gives you courage and helps you be the best version of yourself. Is it easy or hard? How do you remind yourself to stay in your heart? This is great. I'm a brain-first person, but I think being a teacher is making me a little more heart-centered. It's hard not to experience more love and feelings being around these awesome and frustrating kids, right?! Great post. Loved this. 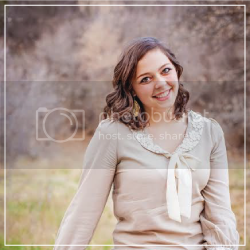 I love this Brooke. I think its hard for some people and easy for others. I am also a brain-first person, practicality is my middle name. However, its days when I find myself thinking with my heart that I find myself happiest and those around me. Thanks for sharing. Miss you. Very nicely said Brooke - thanks for writing this! Right now I mostly think with my bladder. Like "where is a clean bathroom? Will I make it there? Can I run or will that make things worse?" etc. Excited for the day when I can start thinking with other body parts. Haha, I love you Wuckle! Wow thank you so much for this post. SUCH a wonderful reminder.